EGYTRANSCRIPT PROVIDES CONFERENCE ORGANIZATION EQUIPMENT RENTAL FOR SIMULTANEOUS INTERPRETATION AND INTERPRETERS ALL OVER THE WORLD. 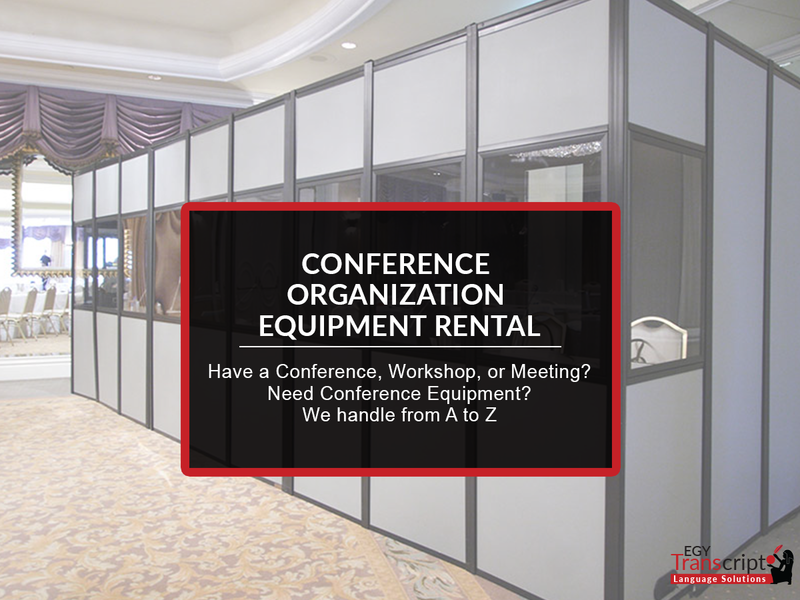 Whether your event is a small meeting or a large international conference, our Conference Organization Equipment Rental service will provide you with interpretation equipment and booths, as well as whisper-interpretation systems. In our translation equipment rental service, we can guide you and recommend most appropriate equipment according to the event. 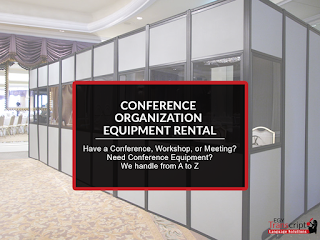 Usually we recommend full-size booths for interpreters and headsets for the audience in case of international conferences or big events. However, in smaller meetings or break-out sessions we recommend a less expensive solution – a portable (tour guide) interpretation system consisting of a small transmitter and wireless receivers for the listeners. At EgyTranscript, we don’t only have some of the most talented and professional simultaneous interpreters and translators, but we also provide translation booth rental. There are some important parameters to be taken into consideration for achieving the best results, for example, booth’s sound insulation, dimensions, and air quality. The sound quality of the headphones and microphones is also of prime importance for the interpreters to be able to listen well and interpret accordingly. It is also substantial for the audience to catch the interpretation. Through our translation booth rental service, we pay utmost attention for every aspect and detail, from the beginning of the event until it successfully ends. الخدمات الصوتية أو خدمة التسجيل الصوتي هي خدمات نستخدم فيها صوت راو يسرد بعض الأحداث أو المعلومات الخلفية؛ عادة تستخدم هذه الخدمة في التليفزيون والراديو والأفلام والمسرح. نحن في إيجي ترانسـكريبت نتمتع بالمقومات اللازمة لتقديم أفضل خدمات التسجيل وخدمة الدبلجة لعملائنا الكرام.نحن متمكنون من اللغة، نعرف كيف ننطق الكلام بشكل سليم تماما، كذلك نهتم جدا بالنبرة الصحيحة للصوت، والوقفات، واللهجة المستخدمة، وغير ذلك مما يمكنه أن يؤثر على جودة خدمة التسجيل. هذا، وسنوفر لك عددا من الأصوات سواء من الرجال أو النساء، ممن لديهم نبرة صوت مميزة من جميع الأعمار والخلفيات، فإنْ لم تكن متأكد أي نبرة صوت تناسب نصك، سنقوم بإرشادك بالعروض والاقتباسات بالصوت واللهجة المناسبين لكي يناسب جمهورك، بما يضمن أفضل خدمات محادثات صوتية. وإليكم بعض الأمثلة التي تستخدم فيها خدمة التسجيل؛ الرسائل الهاتفية، والإعلانات، وإنتاج الأفلام الوثائقية والروائية. العربية هي لغتنا الأم فلا شك أننا نتقنها بطبيعة الحال، كما أننا متخصصون في تقديمخدمات التسجيل الصوتي باللغة العربية بجميع لهجاتها ولكناتها، وهو مايحتاجه الكثير من المنتجين لأنه بالإضافة للغة العربية الفصحى المستخدمة في الأفلام الوثائقية والعروض التقديمية، هناك لهجات عامية لسكان مصر ودول الخليج وسوريا ولبنان والعراق وتونس والمغرب. نحن علي أتم استعداد لتقديم خدمات التسجيل الصوتي باللغة العربية بتلك اللهجات وذلك بفضل فريق العمل لدينا الذي قوامه أفراد ذوو مهارات صوتية ومدربين جيدا وعلى أعلى مستويات التخصص والجدارة ولا يألون جهدا لضمان رضاء العملاء. إذا كان سيناريو الفيلم باللغة الإنجليزية أو أي لغة أخرى وترغب في تحويله إلى العربية، فسنساعدك علي اتمام ذلك، حيث تقدم لك إيجي ترانسـكريبت خدماتها بواسطة متخصصين في الترجمة وخدمات التعريب التي تجعل نصك متلائما مع الثقافة التي تريد مخاطبتها. ونحن في إيجي ترانسـكريبت لا نقدم إلا أفضل الخدمات، حيث نقوم بتسجيلاتنا في الاستوديوهات المجهزة احترافيا باستخدام أفضل المعدات الصوتية لضمان أفضل جودة للصوت والمنتج. يمكنك الاتصال بمتخصصي إيجي ترانسـكريبت في المحادثات الصوتية والتعريب مع شرح متطلباتك وسنقوم بمساعدتك بمجموعة شاملة من النصائح والخدمات. This is another form of interpreting where an interpreter helps two parties speaking over the phone; by interpreting their conversation. Translation can be done in a consecutive manner. Interpretation is a simultaneous translation between two different language speakers. The importance of interpretation manifests at international conferences whether they are political or economic. Furthermore, it has its special importance in covering the global events. The interpreter should be qualified to undertake this difficult and accurate task. We cannot call anyone under any circumstances an interpreter without several requirements that makes him a successful interpreter. As it is inevitable to have a good command of both languages and does not stop only at words level, but he has to perfect their contextual usage to transfer the message honestly, also he has to perfect the pronunciation. Here, he is differed from the translator, as he just needs the written language and does not have to speak. At this point, we focus on the accuracy of both pronunciation and voice from the interpreter to assure the accuracy of the linguistic message. On the other hand, the interpreter should have the courage to face linguistic situations that requires taking a critical decision in order to handle the situation; in this case, the interpreter tends to a reportorial translation rather than interpretation. (If he does not have the courage and the bravery to handle these expected and non-expected situations, he will face situations compelling him to interrupt a train of thought that will confuse conference attendees. An entire knowledge of the general topic introduced at speeches and sessions that are being translated. A great acquaintance of the culture of both languages. A great knowledge of both languages’ vocabulary. The ability to express his ideas clearly and accurately in both languages. The ability to write down notes in a proficient way during the consecutive translation. An experience in consecutive translation not less than three-four years. 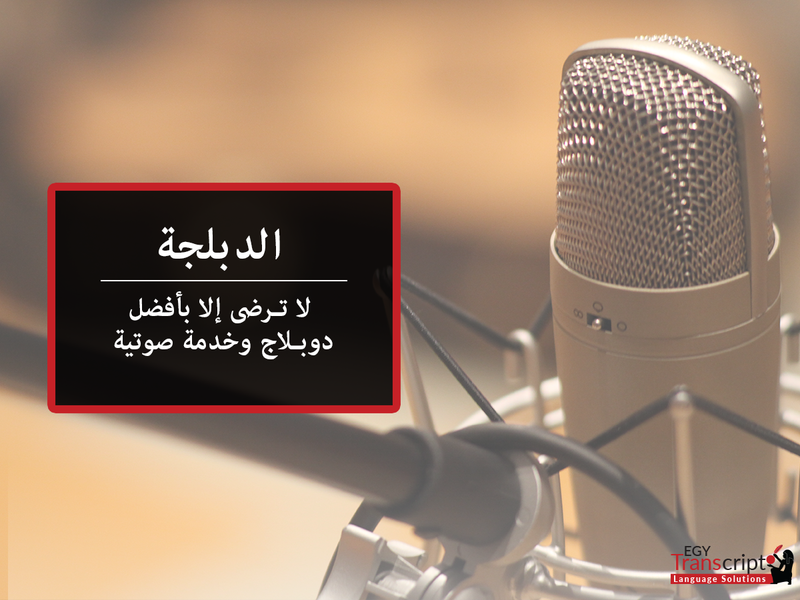 EgyTranscript is one of the leading Arabic English interpretation firms in the Middle East. The clients choose us because of our professionalism, superior accuracy, speed and affordable prices. You can rely on EgyTranscript to get professional management and language solutions for your project. Our primary goal, as Arabic English Interpretation Company, is to establish long-term relationships with our clients and to become an integral part of their expansion to international markets. Subtitling through a translation agency generally involves the written translation of the spoken language (source language) of a television program or film into the language of the audience (the target language); the translated text usually appears in two lines at the bottom of the screen simultaneously with the dialogue or narration in the source language. Subtitling is the main form of translation or “language transfer” in television, which is increasingly developing into a global medium in a world enriched by about 5,000 languages. 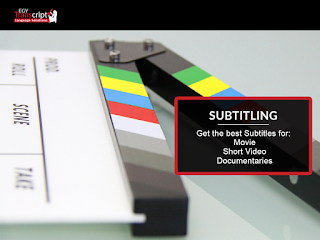 Subtitling Service is not just a form of translation, it is an art that puts into context the nature of the audience with their cultural, linguistic, and communication environment, as well as their preferences. Whether it is English or Arabic Subtitling, it doesn’t entail translating every word; this is because human eye cannot read except a specific number of words, which is different from the ability to listen. That is why there is some form of shorthand that preserves the meaning in fewer words, so that the reader can efficiently grasp the meaning. This does not cause any problems because it is accompanied by the scene being played by the actors; as it is always said “a picture is worth a thousand words”. With several years of experience and wide spectrum of exposure to diversity of media content and working on various business projects, we deserved to be top English subtitlingcompany in Egypt and the MENA region. We have well-trained and well equipped team of professional translators who know how to provide excellent and professional Englishsubtitling to our clients. Transcription services are often provided for business, legal, or medical purposes. The most common type of transcription service is from a spoken-language source (such as a computer file) into text format that will be available for printing as a document, like for example a report. EgyTranscript is one of the best proficient providers in the field of audio transcription service where we have our own guidelines and methodologiesthat we offer our clients. These guidelines, however, can be negotiable. For example, we require the client to provide us with information about the shape of the final document they require, and in case any of our clients requires special font, text formatting, or document outline, we will be happy to strictly abide by their guidelines and deliver the work in the best satisfactory form. One important guideline we apply in all our audio transcription is that whenever the audio file includes insults, curses, or provoking words, we ignore them in the audio transcriptionprocess, unless they are required by the client, like in cases of legal documents that might be needed for criminal trials or other related purposes. It is worth mentioning that we do not provide medical audio transcription services. EgyTranscriptwill be pleased to receive your emails and phone calls about transcription services. We commit to the best standards and respecting deadlines to accurately meet your expectations. As mentioned before, we have our own guidelines and methodologies that are negotiable, based on your very own specific needs and requirements of the final document. 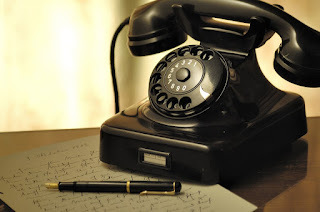 If you need any of the transcription services above, don’t hesitate, contact us and let us talk and work together to deliver you work that meets your needs and even exceeds your expectations, where we promise that EgyTranscript will always be your choice as the quickest and most efficient solution. EgyTranscript offers professional notarized document translation services for your official documents that have to be presented to official authorities for legitimate purposes. Our expert public notary office (Real Estate and Notarization Authority) translators can accompany you to the public sector organizations to provide you with the most accurate notarized translations. There is a big difference between certified translation and notarized translation; certified translation is required when submitting official documents for legal purposes. For instance, marriage certificates, birth/ death certificates, adoption papers, immigration documents, court transcripts, or business contracts that are not written in the official language of the country where the documents are to be submitted. While, notarized translation is more about following official procedures. Notarized translation is usually required for education-based documents like high school transcripts or foreign diplomas. Unlike certified translation, the quality of the notarized translation is not the issue. It is more about fulfilling the formal requirements of an institution. A notary public office (Real Estate and Notarization Authority) translator is authorized to authenticate and oversee different legal formalities and notarized translations. The notarized documents translation might be required by some organizations when submitting official documents such as foreign diplomats and high school transcripts. Our professional translators present the translated document to a notary public, who will ask the translator to swear an oath to the accuracy of the translation. Then, the translator will be asked to sign an affidavit sworn, which must contain the official seal and signature of the notary public before it becomes valid. It is not about the quality of the provided translation. Instead, it is about fulfilling the formal requirements of the institution. As the notary public does not check the quality of the translation, but he concerned more about the identity of the translator. EgyTranscript has a team of highly qualified bilingual native speaking translators. They are carefully selected based on their extensive experience and special areas of expertise. We work on delivering the most professional notarized document translation service that meets your highest expectations. We provide you with high-quality translation services. We double-check every translation project to guarantee the highest possible quality. Official documents are translated and double-checked by expert senior translators with a specialized legal background. We can carry out all relevant formalities through different public sector organizations so that your official documents can be produced in court proceedings. The local laws in each country govern public notary office (Real Estate and Notarization Authority) translators. They cannot give their personal style or tone to the text. They know well that notarized translations must be an exact translation of the source. Our professional translators offer accurate notarized translations, we work to help you get your official documents done with the less possible efforts. At EgyTranscript, we are bound by a commercial confidentiality and corporate nondisclosure agreement. Our Translators take confidentiality and security issues very seriously. With us, your documents remain highly confidential. We deliver accurate translation that meets your deadline and exceeds your expectations. We are one of the fastest growing providers in the industry with capacity to work all over the globe; we are one of the few translation agencies that can deliver on time, every time, regardless of your location or time zone. Cost-effective and professional Arabic to English translation service and vice versa in almost all translation types.